Ocean Craft Marine (OCM) recently delivered a custom-designed, high-performance Search and Rescue (SAR) Rigid Hull Inflatable Boat (RHIB) to Buckeye Marine Terminal in Freeport, Bahama Grand Island along with delivering three days of combined classroom and on-water SAR instruction to twenty-two students. Those students were comprised of Coastal Pilots of Buckeye as well as members of the Royal Bahama Defense Force (RBDF). 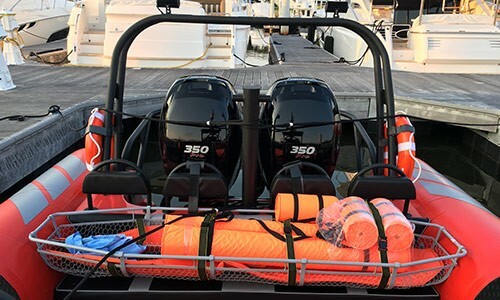 This new rapid response SAR boat will be used to rescue people from the waters of the seaport, in the vicinity of the offshore bunkering jetties, and elsewhere as may be required. 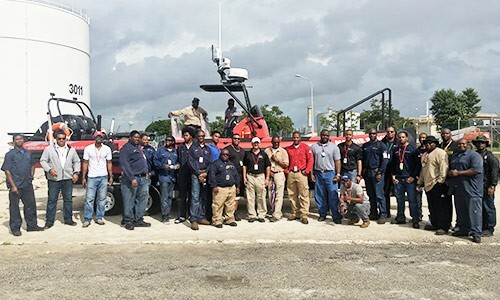 Buckeye Terminals aims to work very closely and coordinate its rescue efforts with the RBDF. “All these students were so highly motivated and attentive to both the classroom and underway training exercises, I am certain that they will have the opportunity to save lives someday.” said, OCM’s Vice President Todd Salus. Freeport, Grand Bahama Island is still struggling to fully recover from the devastating effects of Hurricane Matthew in 2016. Many resort hotels, businesses and homes still remain boarded-up and uninhabited as the locals struggle to reinvigorate a once flourishing tourism business. However, still very much thriving on the island is their large commercial seaport which is collocated with the Buckeye Bahama Global Marine Terminal.